I have been complaining about taxpayer funded art for decades. 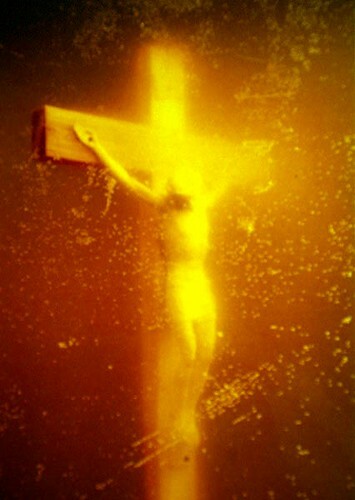 For reasons not known to ration men, the National Endowment for the Arts thought it perfectly appropriate is use public tax dollars to offend a large portion of the pubic by funding Andres Serrano’s Piss Christ. Now I defend Serrano’s right to create art, or so-called art, as he alone sees fit. However he does not have the right to public’s money to offend the public. Unlike Serrano’s master piece, Beck’s work of art was created without the death of any tax payer’s dollars. I fully expect the liberals to support Beck’s right of free speech, just as I defend Serrano’s. Like paragon of reason Michael Moore , CNN’s Howard Kurtz is all wee-wee’d up about Glenn Beck’s “Obama in Pee Pee” art . Who else, he asks, would submerge something in a jar of fake urine and call it art? Evidently Kurtz has misplaced his thinking cap. Again. Sometimes he’s a little slow on the uptake . I may put Kurtz in the running with Elmo for the coveted Sock Puppet of the Year Award.